After Gordon Cooper (1927-2004)'s Mercury-Atlas 9 mission (MA-9), Alan Shepard's (1923-1998) scheduled Project Mercury's Mercury-Atlas 10 mission (MA-10) was canceled. Shepard wrote to Dr. Calvin D. Fowler, the manager and the Launch Conductor for Cape Canaveral Air Force Station Launch Complex 14 (LC-14), to express his appreciation for some photographs that he had sent, and also to express his regrets about the cancellation of MA-10. Original 1-page typewritten letter from Alan Shepard to Dr. Calvin D. Fowler, August 2, 1963: Private Collection of Dr. Calvin D. Fowler. 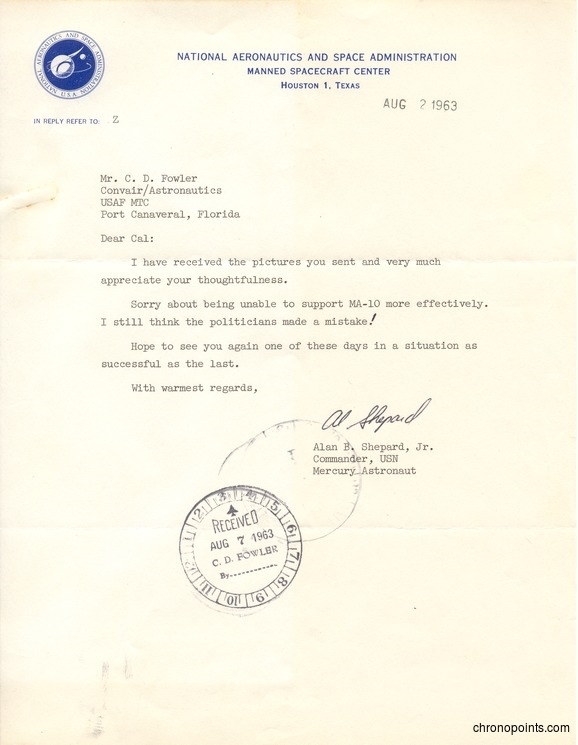 Digital reproduction of original letter from Alan Shepard to Dr. Calvin D. Fowler, August 2, 1963. Originally created by Alan Shepard and owned by Dr. Calvin D. Fowler. "Project Mercury Overview." John F. Kennedy Space Center, National Aeronautics and Space Administration. http://www-pao.ksc.nasa.gov/history/mercury/mercury-overview.htm. Shepard, Alan. 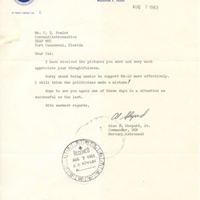 “Letter from Alan Shepard to Dr. Calvin D. Fowler (August 2, 1963).” RICHES of Central Florida accessed April 26, 2019, https://richesmi.cah.ucf.edu/omeka/items/show/4976.